1. Directed at a person's character, not to his or her logic or record; maliciously critical: In rhetoric, an ad hominem argument attacks the defenders of an opposing position personally rather than sticking to the point of the discussion. The editorial in the paper was a very ad hominem piece, directing its attack towards the new mayor. 2. 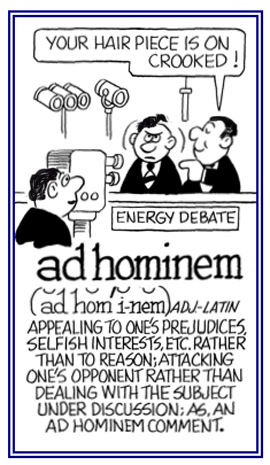 Appealing to personal prejudices or emotions rather than to reason: When debating, participants should avoid ad hominem arguments that question their opponents' motives. The announcers were cautioned not to use ad hominem comments in their radio broadcast. An argument against the man. Argumentum ad hominem is an effective rhetorical tactic, appealing to feelings rather than to intellect, or directed against an opponent's character rather than the subject under discussion. Argumentum ad hominem is considered a logical fallacy, in that such an argument fails to prove a point by failing to address it. In "practical politics" and in many a court of law, argumentum ad hominem is considered persuasive. The same name is given to an argument in which one employs an opponent's words or actions. It has been said that an illustration of the argumentum ad hominem is found in the technique of the defense lawyer who, when at a loss for legitimate arguments, attacks the attorney for the plaintiff, but it is said that this is not the current usage of this phrase in the United States.